monday morning i was driving into work (inbound on 59) on my motorcycle and at some point a black car of some sort got behind me (i think maybe as far out as beltway 8). i was in 3rd lane from the inside. near the westpark exit i was coming up on a slower car in the second lane, and there was another slower car in the second lane a few car-lengths ahead of it. about this time the black car popped over into the fast lane and gunned it. he went past the first car then started changing lanes into the second, inbetween the cars…then into the third lane…in one continuous sweep. i had to slow down because i could tell he was coming into my lane whether i was in the way or not. but he didn’t stop there…he then continued the sweep all the way to the exit for chimney rock. so basically he gunned it, cut between two cars, cut me off, and crossed five lanes of traffic. why? the only possible reason i can think of, based on the events and his behaviour, was so he could get in front of me before he exited the freeway. but he had to block me off and cut across five lanes of traffic to do it. brilliant. and people seriously think driving in houston doesn’t make you part of a game? you’re a part of it whether or not you realize it or want to be a part of it. after work monday i took sue to a bike shop to pick up some mountain bikes she and jack had left there for some time after taking them in for repairs. i’m going to give the men’s one a try and see what i think of it. perhaps i’ll actually start getting some kind of exercise. i doubt it, but i guess it’s possible. tuesday night i went to trivia at the flying saucer. evidently it was the last tuesday night trivia. we then headed — as tradition dictates — to sambuca. i had called brad to see if he wanted to join us, and he called back and said he was coming. around midnight sambuca was closing up shop so we headed to dean’s. on the way we ran into two rather hammered british guys who were trying to find the whiskey bar…or any bar. they came to dean’s with us. then they continued to drink, drink, and drink. they were funny, but were toasted. they were evidently both doing “security” in iraq, i believe for oil and gas companies, and one or both were ex-military. eventually the bartender cut one of them off, so he left in search of another bar. then the bartender cut the other one off. but it was about time to go anyway. we walked outside, said our goodbyes, and he headed off in the other direction. they were supposed to be flying back to england the next day…i hope they managed to get back to their hotel room and catch their flight. they had a digital camera and we took a few pictures with me and brad and them. i gave one of them one of my personal cards that has failure.net and my email address listed. i wonder if they’ll:  still have the card,  know what the heck it is in reference to,  tie it to the pictures, and  send me a copy of them. it’ll be interesting to see if or how they remember the evening. or at least the two or so hours of it they spent hanging out at dean’s. i upgraded my blog software yesterday. comments have been set for some time to where i have to approve them before they show up, but i have been getting a steady stream of splog for the last couple of months — a few times getting 50 to 100 in a day (or an hour or two). it’s nowhere near the pain some bloggers have gone through — most likely because my blog isn’t popular or well-linked — but it was enough that i finally decided i would upgrade to give the new version a shot at controlling the crap. so far, it’s doing pretty well. yesterday afternoon i went to the alamo drafthouse and watched nacho libre. i’m iffy on jack black, and this was hess’ sophomore effort after the sweet napoleon dynamite, so i was mixed between having high hopes and not expecting much. fortunately, jack black was fairly reigned in throughout the film — which i prefer (e.g., school of rock) — and much of hess’ quirkiness was still evident. so overall i thought it was a solid sophomore effort for hess and a good turn by jack black. i spent saturday night riding around with brad and kelly. the evening started poorly, as i came in on the downtown feeder and hit elgin/westheimer, only to find it closed a few blocks from montrose due to the gay pride parade. and i was on the wrong side of the street (so to speak) because i was heading to diedrich’s. i was forced to turn north, but i figured i could go past it and around. what i didn’t know was that they had it blocked off all the way to shepard. *sigh* going through crowded side streets with cars and pedestrians took awhile. when brad and kelly showed up we hung out at diedrich’s, then we drove around awhile, stopped at la carafe for an hour or two, then rode around some more. it was nice being back on the bike, and my lighting mods all seemed to function nominally. Author TeRRYPosted on 26.June.2006 @ 21:44 1 Comment on upgrade. nacho. lucky! a couple of months ago i ordered a new backend for my bike. 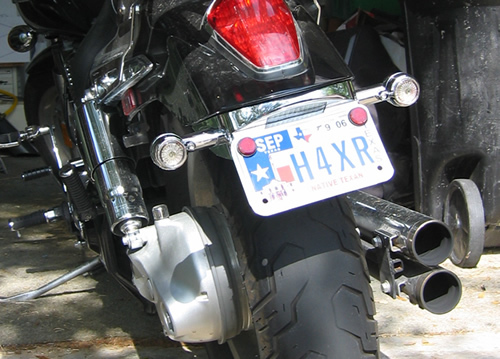 it was a license plate mount that also replaces the stock blinkers. 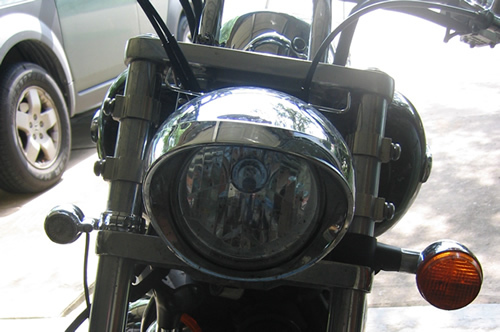 the new piece is chrome and the license plate light and blinkers are l.e.d.s. it’s a different look for the bike, much smaller and cleaner and…uh…chromier. a couple of weeks later i decided as long as i was changing the back blinkers, i might as well replace the front lights/blinkers as well. so i bought the same type of lights for the front. then i had to buy the mounting brackets. then i had to return the one that arrived…they didn’t come in pairs, plus it wasn’t the right size anyway. so i ordered a new pair. i picked up those this last weekend, so i had everything i needed to do the job. i started working on it last weekend, but i didn’t get too far. since it was raining during the weekend and was supposed to be raining during the week, i figured i wouldn’t be able to ride the bike anyway. but i also didn’t think i wouldn’t get done until today. weeknights always seem to have a way of disappearing without anything getting accomplished. in case you’re wondering, i bought a chrome plate and mounted it on the right side to put the inspection sticker on. not having that big plastic license plate border and inspection sticker really cleans up the back as well. if you couldn’t figure it out, the new is left, old is right. anyway, i’m pretty happy with the mods, and everything appears to be working properly. so now you’ll have to excuse me while i go for a ride. it’s been over a week since i was on the bike! in 1997 or 1998 i was with tamara and she suggested i consider replacing my standard post hoop with a gauge captive hoop. it seemed like a logical choice: it doesn’t come or fall out, it has no post to poke into your head, and it’s a clean, simple style. note to those not in the know: with gauge jewelry the wire passing through your piercing is a certain thickness – the gauge. there is no regular “earring-sized” post or section of the jewelry…the same thickness of wire goes through your piercing. so basically you have a bigger hole in your ear (or whatever body part you got pierced…you’re on the internet, look it up). the smaller the gauge, the bigger the diameter of the wire. with a captive hoop, the wire is bent into a circle except for a small gap at one point where a ball with divets on opposite sides is pinched between the ends of the hoop, thus closing the hole and keeping the jewelry in place. tools are used to get the ball between the hoop ends and the tension of the pinching keeps it in place. anyway, so tamara and i headed to taurian (on westheimer near montrose) and got my hole stretched. they said based on standard earrings (around 20 gauge), they could stretch to a 16 gauge, maybe a 14. since i wanted something a little bigger, i decided to go 14.
note to those not in the know: stretching means taking a tapered rod that starts at a dull point and ends at the gauge size you’re going to and sliding that through to stretch the hole, then following the new jewelry behind it. i had that solo 14 gauge captive hoop for years. at times i would consider getting my other ear pierced, and/or getting a bigger gauge hoop, but i never got around to it. then finally in june of last year (2005) i decided it was time. i went back to taurian and replaced my lone 14 gauge with a 12 gauge in each ear (stretching the 14 and piercing the other ear). although i was worried about a repeat performance of my near passing out, everything went quite smoothly. the new jewelry was the same as the 14 other than gauge – 7/16 inch surgical steel captive hoops with surgical steel balls. well, after work today i went by taurian and replaced my 12 gauge captive hoops with 10 gauge ones. i kept the same hoop size and they’re still all surgical stainless, so it’s probably not all that obvious. there was absolutely no drama this time either, although the left (older) hole was a tighter stretch than the right. those 12 gauges were with me 24/7 for one year. and that single 14 gauge was with me 24/7 for longer than my marriage lasted. and yes, there is a reason i got the 12’s in june last year and why i upped the gauge in june this year. i will leave it as an exercise for the reader(s) to figure out what that reasoning might be. pursuer: individuals with this style expect a great deal of contact and closeness; usually want more time and attention than their partner does; are sensitive to rejection; get anxious when separated from their partner; want more information than their partner gives; focus more on what they donâ€™t have than what they do; are often perceived as needy; are better at giving love than receiving it; get upset easily; hold grudges; are hyper-vigilant about their partnerâ€™s behavior. avoider: individuals with this style want and need a lot of time alone; are often less talkative than the partner; are sensitive to any form of control; are often quite self-sufficient; give little information; withdraw when upset; have difficulty expressing their feelings; are often very involved in their work. follow the link to read more, along with one of those kind of pointless self-scored quizes. when entries appeared on digg and slashdot about a webpage set up to shame some folk who’d decided to keep instead of return (with a reward offer, even) a sidekick that had been accidentally left in a cab, i was curious. so i went there. evan was posting updates frequently, so it was fun to go back every now and then and see what progress or frustration had occurred. and there were a lot of both. the page started on june 6th and it was quite the drama…physical threats, legal threats, contradictory stories, helpful authority, unhelpful authority, enthusiastic public support, backlash, etc. well, yesterday justice appears to finally have happened. which i am mildly surprised by, but glad for. the story even made it into the new york times today. congrats, evan. well, gee. i had intended to write another entry within a day or two of the june 12th one…i even had a number of topics. unfortunately, the mundane details of life that amount to little but fill my waking hours kept me from doing so. such is life, i suppose. a couple of weeks ago i finished reading the twelve (the lives of the apostles after calvary) by c. bernard ruffin. it’s a collection of information about each of the twelve apostles. it’s amazing how little is known about all but two or three. within a few pages i decided maybe mr. ruffin was high church. i figured catholic, but apparently from google he’s lutheran. but catholics like him. the book seemed well researched, and honest about what is known and what is unsure or contradictory or not know at all. anyway, the book was interesting. i can understand why stories and histories weren’t written, or things happened and no one wrote about them. then after many years passed and those there at the beginning began dieing, and the church became more established and stable, people became interested but there was little info and much of it was a tangled mess of gaps and contradictions. still, sometimes in the slick presentation and soundbyte style of modern xianity we lose touch with the inherent humanness and life of the church and the faith we profess. why so many american protestant churches have robbed their members of the depth and meaning of the traditions and history of xianity, i have a hard time understanding. it is a history of the faith of our fathers (good and bad), and the traditions are ties to the centuries of believers who came before us. the movie i saw in austin with my brother was the puffy chair. it’s a road trip and relationships story, written and filmed for about $15k by jay and mark duplass. i think they used to live in austin, so i’m not sure how many screens it’s shown on (as it’s indie and probably a pretty limited release). but it was really cool. i’m not going to say it was great, but there was some greatness in it — mostly dialogue and delivery. the basic idea is josh (played by mark duplass) found a big purple recliner on ebay and bought it, planning to give it to his dad as a present for his birthday. (his dad had one just like it when josh was young.) he’s going to make a road trip to pick it up and deliver it to his dad. on the way he’ll stop for a quick visit with his brother, rhett. after an argument with his girlfriend kathryn the night before departure he decides to ask her to come along, which she does. they stop to visit rhett, who’s an interesting character in that spacey, deep yet shallow, kind of way. he ends up joining them for the trip. the rest of it is a comedy of bad decisions and awkward situations, leading to heightened tensions and the highlighting of weaknesses in josh and kathryn’s relationship. the movie has a low budget and indie feel to it, but i didn’t think it generally distracted from the well-written and well-paced plot and the good job by the actors. it had hilarious moments, but also some very honest moments about things that go on between two people in a relationship. my motorcycle turned two years old today. yep, two years ago today i drove away from a honda shop on a brand spanking new black 2004 vtx1300. as an unintentional birthday present, jay lee of the radio show i’m involved with recently put up a blog entry centered around a pic of my bike. thanks jay! as i rolled it into the garage tonight and stopped, my odometer sat at 23898. that’s almost 12,000 miles per year. (i had hoped to hit 24k, but it wasn’t meant to be and i wasn’t going to get fake miles.) yes, i do use it as my primary means of transportation. (though it’s not my only means.) my bike and i have been through Texas, oklahoma, arkansas, missouri, illinois, tennessee (barely), louisiana, mississippi, and alabama (barely). i managed to add about 700 miles over this weekend. i headed to austin on saturday, then on sunday rode with my brother to mason for a family reunion, then back to austin, then back to houston. that was a lot of riding on sunday. i was pretty freaking tired today. the reunion was good, but i volunteered for something. hopefully that will go well. i saw my mom and dad there for a few hours. my brother and i also stopped by art and i showed him the electrical work my dad and i did while i was in brady. and while i was in austin i hung out with ash, who is visiting the states for a couple of weeks. hopefully i’ll also get to see him here in houston sometime during this visit. i finished a book a couple of days ago, and i’ve got some other information i want to get on ye olde blog, but i’m afraid the riding around has plumb tuckered me out so i’m going to call it a night. at the end of work today, on a whim i decided i’d go see art school confidential. two of my coworkers agreed to go with me, which was cool. unfortunately, i don’t think the movie lived up to my expectations. there were parts that were good, and some of it was pretty funny, but overall i just didn’t leave feeling content with it. i’d have to recommend the two movies i saw on sunday above this one. unfortunately, no alabama is available to join me these days. i had to make due with mulling the movie over inside my head. ah well, hopefully the fates will smile on me eventually. i started off the day’s activities by heading to empire cafe, where i had a late lunch / early supper consisting of a garden salad with ranch dressing and the pasta rustica with iced tea to drink, followed by a coffee desert drink they call a milky way. i like empire, and i’ve had all of the above before. but i should have stopped before the desert drink because i was freaking stuffed. perhaps the caffeine helped me with the rest of the evening though. so then it was to the angelika downtown to catch a couple of movies. i wanted to see art school confidential, but the (movie) stars weren’t in alignment for such an event. instead, i caught brick and the proposition. both of which i’d only learned about by checking what was showing. although i didn’t know it beforehand, one thing they both had in common was a sort of mash-up or blending nature. the proposition is a western. imagine any clint eastwood western…like the outlaw josey wales. or perhaps high plains drifter would be a better choice. this western is set and filmed in australia. the events occur during the british settling of australia. there are some disturbingly grisly scenes of violence, but a lot of beautiful scenery. the main villain is cut from the “intelligent and evil” cloth, quoting poetry and spouting prose as flippantly as he kills and/or tortures someone. the screenplay was written by nick cave. (if you know who that is.) i liked the movie, but it leaves you feeling somewhat unsettled by the events that have unfolded in the context of the hellhole you were dropped into when the lights dropped and the movie started. brick is a sort of film noir, detective piece. except it’s set in the context of your typical high school film. it seems like a risky angle, but i was impressed and thought it was an entertaining and well-created movie. the plot and dialogue are driven by classic detective films (e.g., humphrey bogart films), but the situations and parts are all played out by high school kids (although they never seem to actually attend class). written and directed by rian johnson, edited on his mac, it’s his first out of the gate. i was impressed all around: dialogue, framing, plot, etc. it’ll be interesting to see what rian might pull off for a sophomore effort. regarding that “manipulated and taken advantage of” bit…i’ll probably have more to say on that here in the near future. we shall see.